It is the summer of 1969. On their way home from church, young Billy Briggs’ parents are killed in a fiery crash. Billy’s belief in God, strained by the accident, is further tested when he is sent to live at a lonely, run-down farm with his uncle, an abusive alcoholic with a lazy live-in girlfriend. Billy tries to make the best of the situation, but things spiral out of control when the boy witnesses his uncle committing murder. Now Billy must survive until he can get to town with evidence of his uncle’s foul deed. In the end, only his wits and faith can save him. Billy comes away from his ordeal battered physically, but stronger emotionally and spiritually. 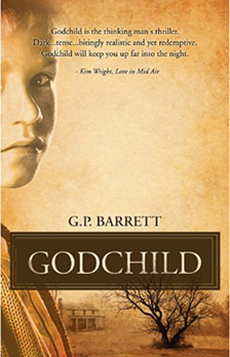 A heartfelt coming of age thriller, Godchild will have readers terrified and entranced from the opening chapter until the final page. © 2017 Paul Barrett. All rights reserved.